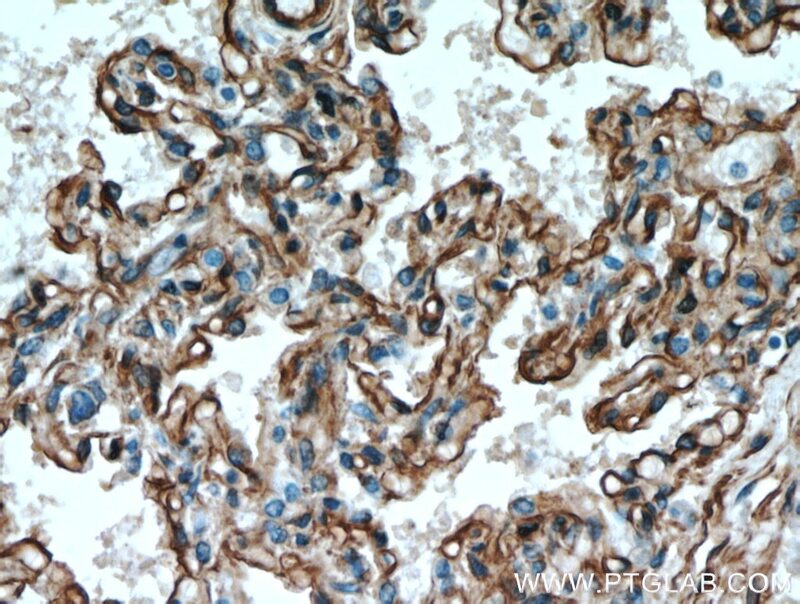 Immunohistochemical analysis of paraffin-embedded human lung cancer tissue slide using 16447-1-AP (Caveolin-1 antibody) at dilution of 1:200 (under 10x lens) heat mediated antigen retrieved with Tris-EDTA buffer(pH9). 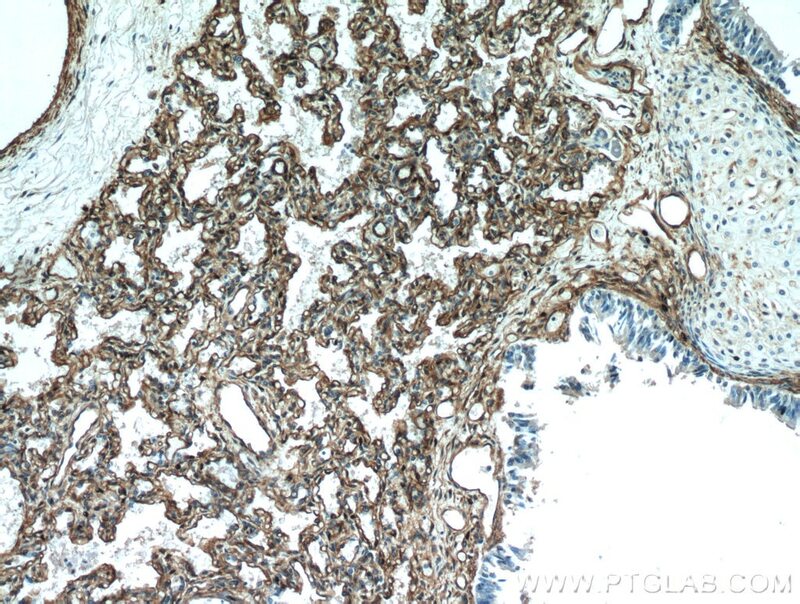 Immunohistochemical analysis of paraffin-embedded human lung cancer tissue slide using 16447-1-AP (Caveolin-1 antibody) at dilution of 1:200 (under 40x lens) heat mediated antigen retrieved with Tris-EDTA buffer(pH9). 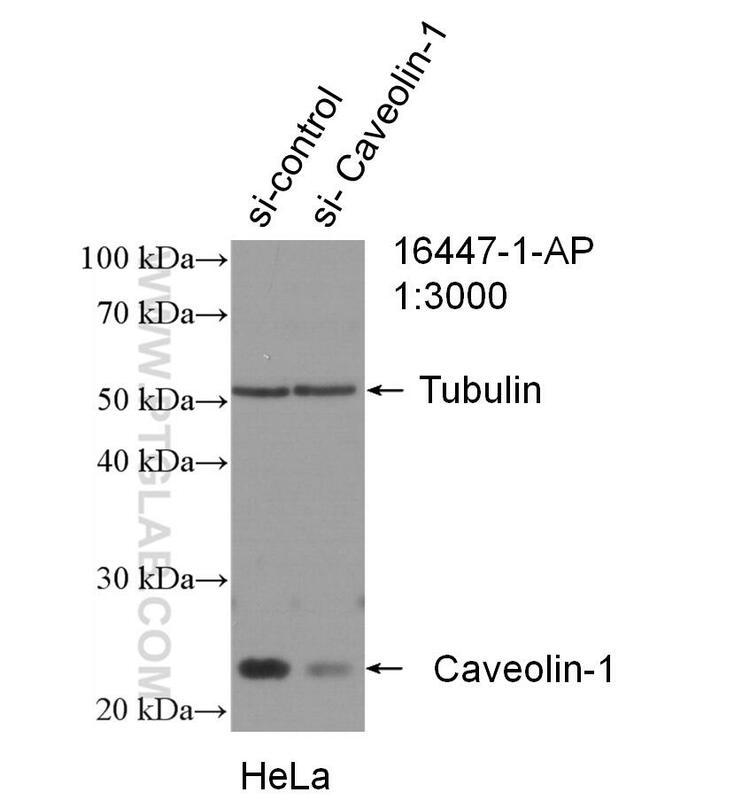 IP Result of anti-Caveolin-1 (IP:16447-1-AP, 3ug; Detection:16447-1-AP 1:500) with A549 cells lysate 1200ug. Caveolin-1 (CAV1), a multifunctional protein, is the main constituent molecule of caveolae and represents a scaffolding molecule for several signaling molecules including epidermal growth factor receptor (PMID: 19641024). 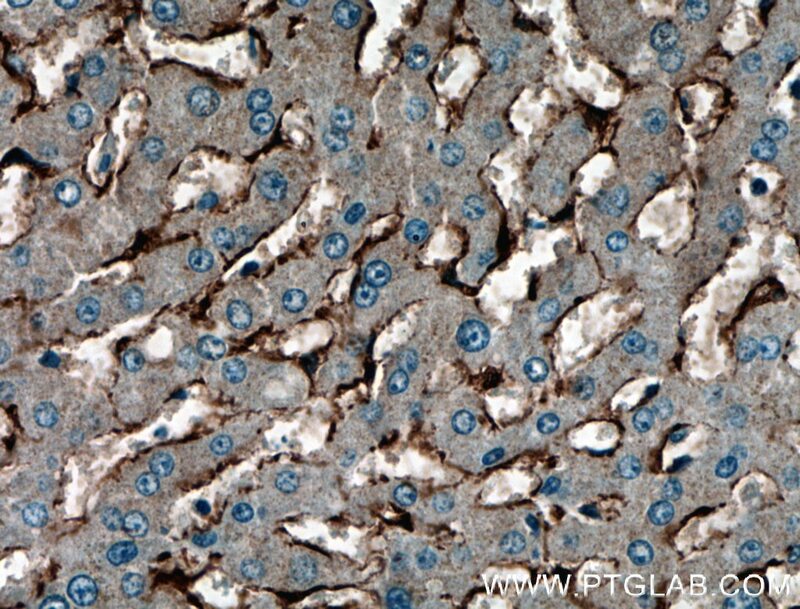 Several studies have implicated that a reduced expression of CAV1 was found in cancers including head and neck carcinoma (PMID: 19002186). However, other studies recognize CAV1 as a tumor promoter because CAV1 is overexpressed in various kinds of cancers, especially in oral cancer (PMID: 20558341). 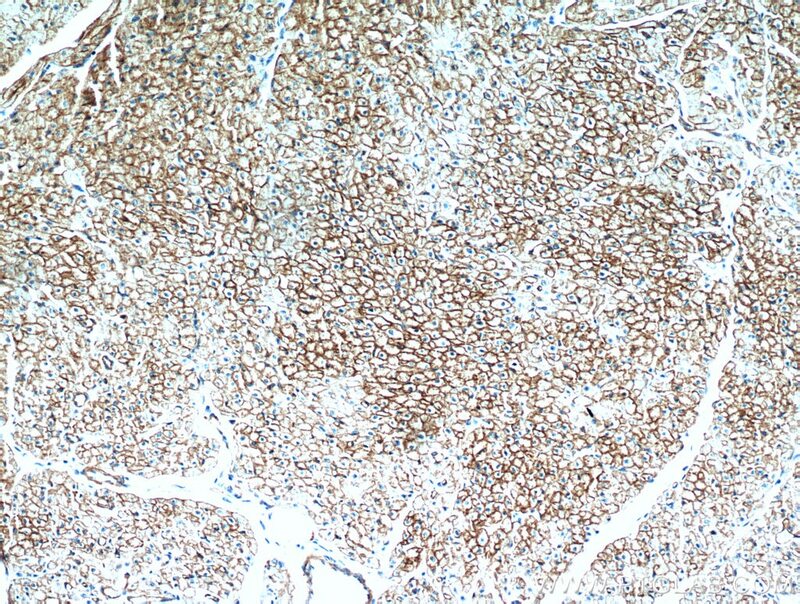 Recent study also show that CAV1 is involved in astric Cancer (PMID: 25339030). 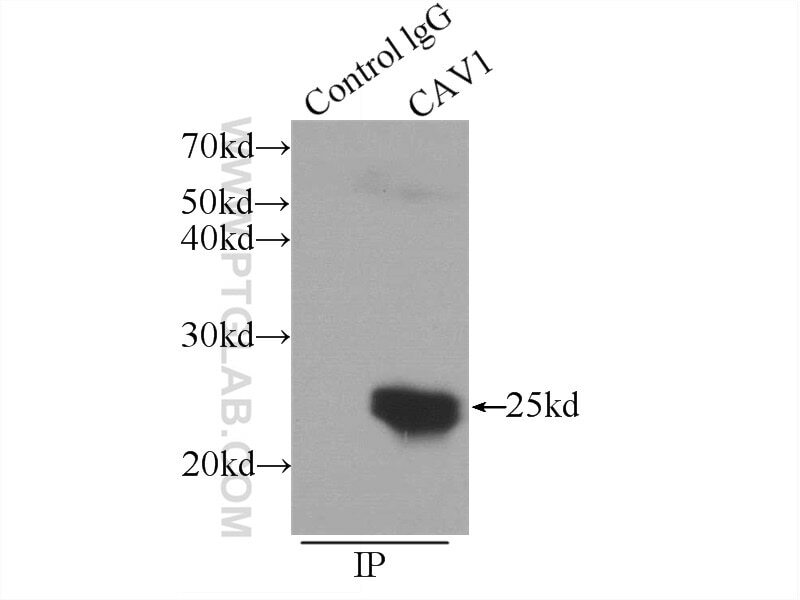 MW of Caveolin-1 is from 20-25 kDa due to phosphorylation (PMID: 10198051). 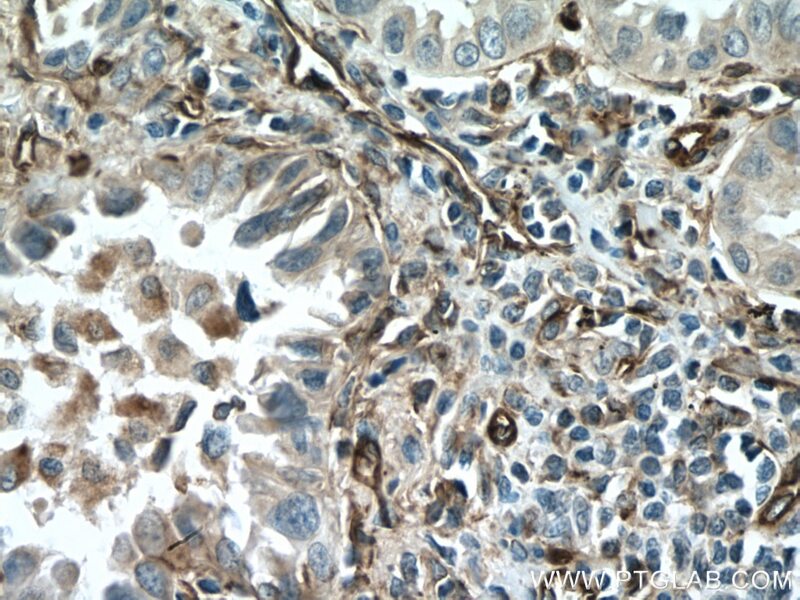 miR-203 inhibits tumor cell migration and invasion via caveolin-1 in pancreatic cancer cells. Tumoral microvesicle-activated glycometabolic reprogramming in fibroblasts promotes the progression of oral squamous cell carcinoma. Network-pharmacology-based identiﬁcation of caveolin-1 as a key target of Oldenlandia diffusa to suppress breast cancer metastasis. 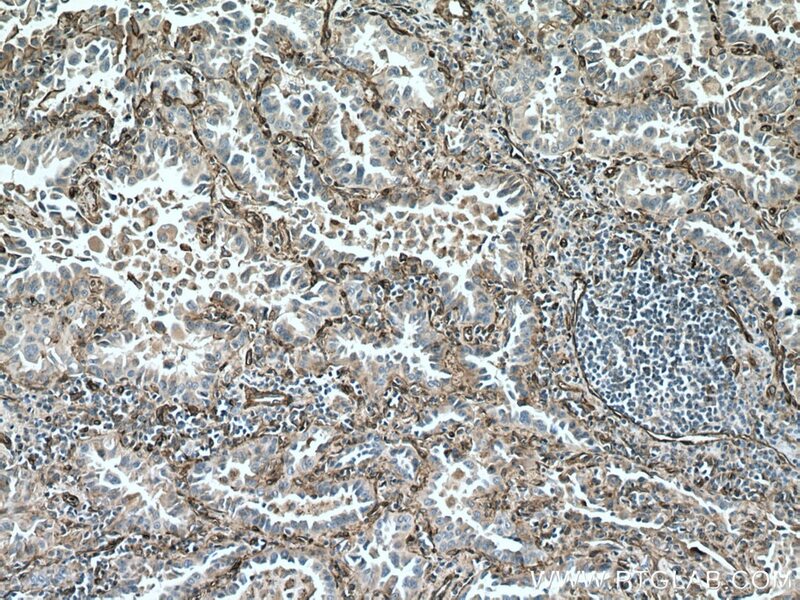 Dihydroartemisinin inhibits the viability of cervical cancer cells by upregulating caveolin 1 and mitochondrial carrier homolog 2: Involvement of p53 activation and NAD(P)H:quinone oxidoreductase 1 downregulation. Calreticulin promotes EGF-induced EMT in pancreatic cancer cells via Integrin/EGFR-ERK/MAPK signaling pathway. TGFBR-IDH1-Cav1 axis promotes TGF-β signalling in cancer-associated fibroblast. 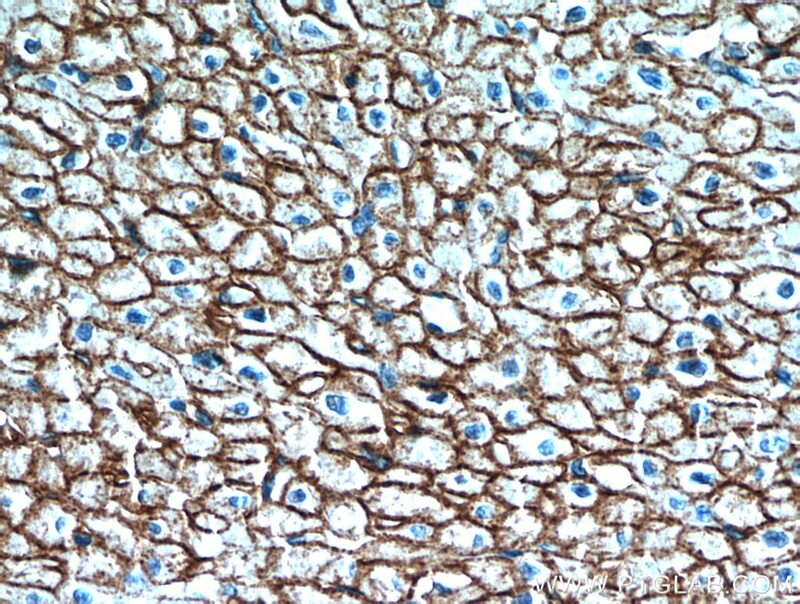 Immunohistochemical analysis of paraffin-embedded human liver tissue slide using 16447-1-AP( Caveolin-1 antibody) at dilution of 1:200 (under 10x lens). 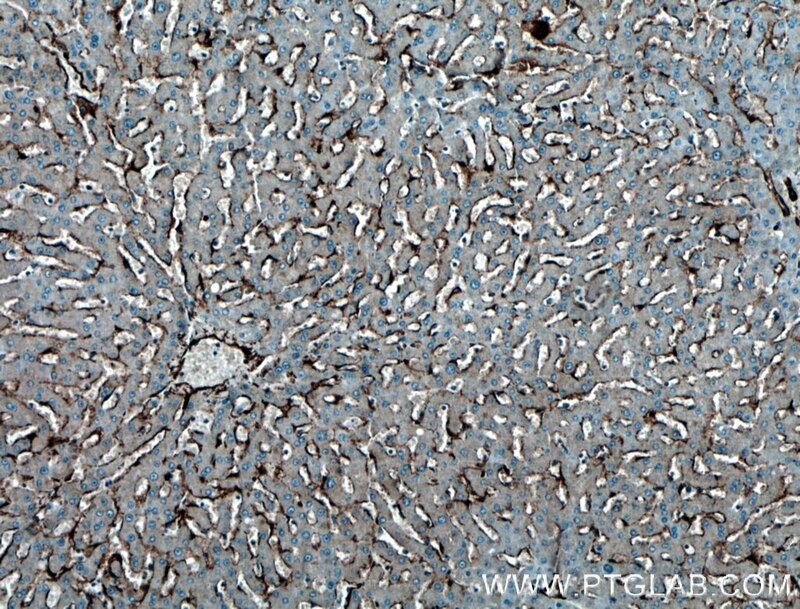 Immunohistochemical analysis of paraffin-embedded human liver tissue slide using 16447-1-AP( Caveolin-1 antibody) at dilution of 1:200 (under 40x lens).